We were fortunate to have friendly drivers for all our HailO/Uber rides in Ireland and NYC. From all walks of life and ethnicities, it’s always eye-opening and interesting to meet new people in our travels. On the taxi ride home (using HailO as our Irish go-to app for taxi service) we were greeted with a hearty smile and lots of good conversation with Mark Rooney, our driver. Asking Mark what rush hour looked like in Dublin, as we were leaving around 8 a.m. when the roads would be choked with traffic in Seattle or NYC, he said that he has seen the rush hour creeping earlier and earlier there but certainly not this early. When we were in Amsterdam last year, we were surprised that the streets were deserted until around 10 a.m. The work day starts later in Europe as it did in China when we lived there. I remember going into the office at 9 a.m. and being the only one there. 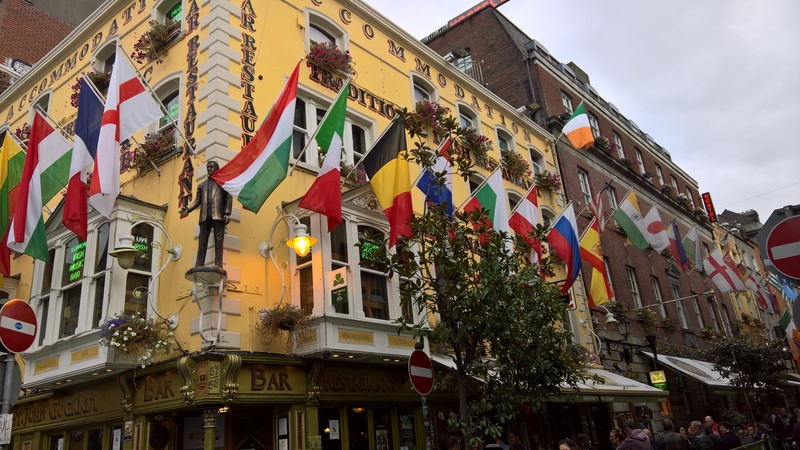 As we cruised along with far less bus (double-decker of course) traffic than I had seen mid-day, we started discussing the Irish economy as compared to the US and then we finished the trip discussing Trump and politics. Of course. The Irish are having a good laugh at our messy election process. Their election cycle is 6 weeks from start to finish. None of this year-long reality show that we have gotten ourselves into, especially with the latest drama. Mark was saddened by the state of the Irish economy. He told us that his teen-age sons had asked him how much a house would cost to buy in Dublin. In an average neighborhood, it would be $300,000-$400,000. Not cheap. Home buyers can get mortgages (30-year) and have to put at least 20% down but, as Mark bemoaned, how can most people save money to the tune of $60,000 or more on average wages. He felt that the government should require companies to take their profits and pay their employees more money. Though colleges cost far less in Ireland with government assistance, there is still student debt looming over the youth as they start careers, adding to the concern that buying a house will be out of the question for his sons even if they go to college and graduate. Complaining about the “rich” corporations again, Mark had asked Google to sponsor his son’s sports team and never got very far. He wrote them a letter, trying the old-fashioned approach to communications. He wondered why tech companies don’t give more back to the communities. I told him all about my company and how much they donate through free software, matching funds for employee donations, etc. He was surprised and said that the company should make people aware of these efforts. He had no idea. I related that the company is proud of its giving back but doesn’t want to capitalize on it through advertisements. They are very humble in this regard. I am proud of them. The conversation inevitably turned to “WTF-how can the US have Trump as a candidate for President?” Well, how do you answer that? I am ashamed that he is one of the two possible leaders. He is neither qualified nor quite frankly sane. He does understand how to tap into the uninformed voter, the frustrated out-of-work voter looking for any type of assistance including the empty promises that Trump is making and the racist who wants to build walls and close borders. Mark assured me that the people of the US would not let this world catastrophe happen and that Hillary would win. I hope to God he is right. If not, we may be using Thom’s Irish citizenship to immigrate to Ireland to escape the madness. Feck it! Cheers to HRC for taking on the bully and dedicating her life to public service. Well done.